What are the observed different types of Warp Drives? Discussion in 'Trek Tech' started by KamenRiderBlade, Nov 16, 2018. Any other forms of Warp Drive from alien races or StarFleet ships that I might not have noticed? 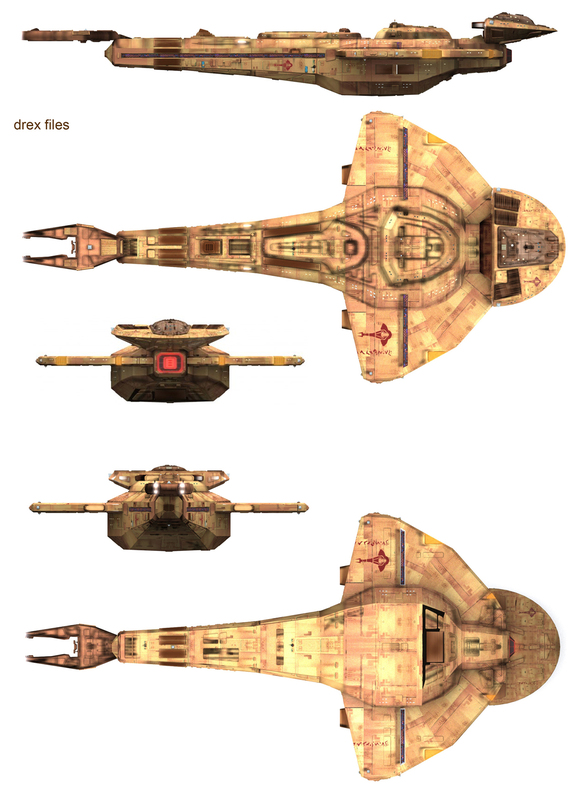 The only one I can think off the top of my head is the Voth City Ship. This is great follow up to that discussion in the other thread. Now that you've included the presence of the cooling fins, I'm slowly warming to the notion of flat panel FTL systems. There's also the interestingly prevalent drive where distinct nacelles can be seen, but they are of an exotic shape, curved this way or that, triangular, what-have-you - and basically the very opposite of parallel. As for "nozzle" type, basically all the Starfleet ships have nozzles to their sets of warp coils. Some have them in front or aft, some to the sides, some to the top, some to the top and sides. Sometimes the side nozzles go all the way around the nacelle stern, sometimes not. Tucking the coils in and having extra hull plating around them doesn't IMHO yet distinguish them from the "nacelle" type qualitatively. Warp engines without a "nozzle" in evidence are relatively rare. Kirk's old ship sometimes counts; some incarnations have blue glow associated, though. On the other hand, "wings" are surprisingly prevalent in alien ships, including wings that couldn't possibly have aerodynamic merit. The Talarian stock of ships, also serving many other nationalities, is the foremost example. But partial "wings" or "fins" crop up in the most unlikely places. Are they a key element in a warp propulsion system, or a nice-to-have extra, or something unrelated to propulsion altogether? Even UE Starfleet's old Intrepid has those. Do Starfleet pylons, the broader ones, in fact double in the role, too? I know they are there on alien ships, but it's been a while, can you name a few examples? I'm not talking about Warp Nacelle placement or direction of Warp Grilles specifically. And most StarFleet Warp Nacelles have the Warp Fields emit out laterally over 2 sets of grilles or one wide set of grilles. But you do understand how I distinguish one large Nozzle for Warp Field Grille / Emission pathway vs the usual lateral array of tiny holes in parallel to each other. Especially the distinguishing factor of the Nacelles being buried within the hull of the vessel. 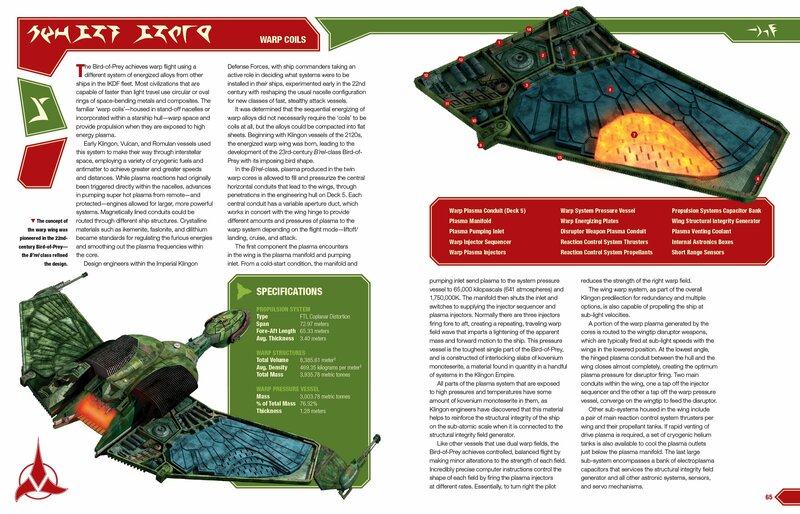 That's why I pointed out the Cardassian Galor Class & the Defiant. It could very well be, Co-Planar Warp Drives might be more common than we think in the universe, we just haven't observed them as much. I can see merit to it's design given what it does. I'm looking at the Defiant and don't really see any nozzles related to her warp engines. What nozzle are you referring to? I think its the grill pattern at the back of the nacelle being referred to here on Defiant. Though on the Galor, are we thinking he glowing bit at the back of the wings is part of the warp engines, rather than the impulse units, or are we calling the forward glowing bit a nozzle? Though on the Galor, are we thinking he glowing bit at the back of the wings is part of the warp engines, rather than the impulse units, or are we calling the forward glowing bit a nozzle? Those nozzle like bits on the saucer head that points aftwards. Ahh. Do you think they are functionally different than the blue grills on the Galaxy and Ambassador-class ships that are also visible to the rear. Plus the other ships who have blue grills on the sides of the nacelles - would they also function differently and if so, why the common blue glow? I would have to say yes! Imagine that the Warp Fields are like water flow, but in Zero G. Warp Nacelles are analagous to garden hose nozzle attachments, what you attach controls how the water flows out and in what direction. With traditional Warp Nacelles that StarFleet uses, the flows out of the sides and/or back are lots of tiny fields. While the Cardassian Ships / Defiant have two big concentrated nozzles facing aftwards. Those are two very specific ways of dealing with the emission of the Warp Fields. Then you look at how the Klingon Bird of Prey is described when it makes a Warp Field. The two halves of the Co-Planar Panels control the turning while it also controls forward Warp Propulsion. There's not right or wrong way of creating a Warp/Field. Just the trade offs in how you want to get there. Wait a sec, I thought that TNG (especially Enterprise) explained the emission of warp fields came from the warp coil(s)? If I understand your explanation, rather than the coils in the nacelles generating the warp field to expand out in all directions instead you are suggesting that they use nozzles to jet the field backwards and then steer them so it loops forward to wrap around the ship? No, I think you're misunderstanding my analogy. The major gaps in the warp coil and the Blue Warp Field Grille for StarFleet ships indicate which direction the Warp Fields are emitting out of before they form the Warp Bubble. The entire Nozzle and water hose is just an Analogy for you to try to understand it easier. I still don't get it (but that's alright ). Wouldn't it be simpler to just think of the warp field as being able to expand in a sphere/bubble and pass through everything to encompass the ship? Wouldn't it be simpler to just think of the warp field as being able to expand in a sphere/bubble and pass through everything to encompass the ship? I don't see that as how it would work, otherwise why would they need Warp Field Grilles? Wouldn't they just bury this inside the ship then? Or that the bubble / shields aren't all that big to begin with, just big enough to wrap around the vessel. in a ovular shaped bubble. As far as the plasma venting, there are specific Plasma dump ports on the Warp Nacelles, the Enterprise D literally had them on top and it's in the technical manual. Can you point out where these plasma dump/vent ports are in the TNG:TM? I have that book and am familiar enough with it where I don't recall seeing any diagram of it. Or are you referring to a different TM? Well it looks like neither one of us guessed correctly . 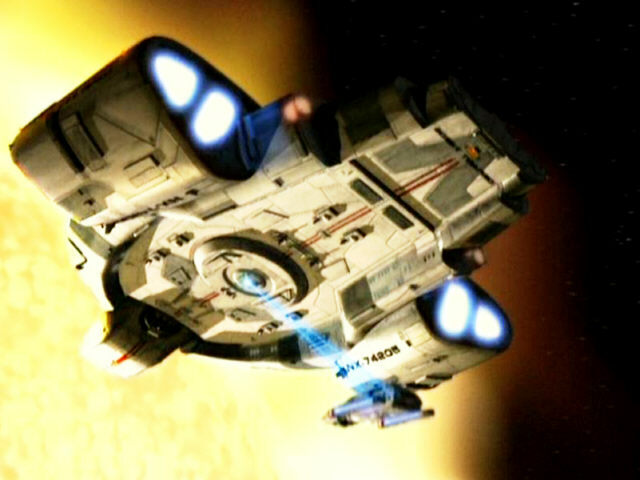 In "Eye of the Beholder" we see the E-D's plasma venting system engage for the starboard nacelle and the vent is on the bottom of the nacelle near the front.